I know most of my recipes are easy-peasy and inexpensive to make. I tend to lean that way due to my tight schedule and limited budget. And based on the blog statistics and analytics, it seems those are your favorite too! So I try to give you what you like. But I got skills, y’all. I don’t get to use them as often as I’d like but understand this… if I had all the time and money in the world, I’d never leave my kitchen. I’m absolutely obsessed with cooking. I’ll spend hours researching methods and recipes, watching videos and television shows and pouring over cookbooks to find the one best way to make something. That’s why I get so excited during the holidays because those are the times when I can cook like I want to! I love Thanksgiving because I get to spend two. whole. days. preparing and cooking my Brined and Slow-Roasted Jive Turkey recipe. And this Christmas I decided to go all out too! I put a lot of thought into this recipe and a lot of time documenting the cooking process. I hope you’ll add it to your Bucket List of things to make someday because it really was absolutely divine! I have to say this, though... after all that went in to cooking this, I was super disappointed to discover I must have had a smudge on my camera lens. I took about 45 photos of this beautiful creature and only a few were clear enough to publish. Just trust me when I tell you this was a thing of beauty and the photo doesn't do it justice! Read full recipe before cooking so that you can allow for necessary time. Also, make sure to note the Au Jus cooks in the pan the last 30 minutes of cooking time. Set roast out for one hour at room temperature then preheat oven to 450 degrees. Trim away any excess fat from roast. Liberally season all sides of the roast with salt and pepper. In small bowl, mix together mustard, olive oil, garlic, rosemary and thyme then rub herb mixture evenly over beef roast. If your roast is frenched (rib bones included but cut away from the roast and secured with butcher’s twine), leave twine and bones in place. Spray roasting rack with cooking spray then set inside roasting pan. Place roast, rib-side down, onto roasting rack. Bake at 450 degrees for 20 minutes. Reduce oven temperature to 350 degrees then cook for 18 minutes per pound for rare, 20 minutes per pound for medium-rare or 22 minutes per pound for medium, or until thermometer registers desired temperature*. Remove roast from oven and cover pan loosely with aluminum foil. Rest roast for 20 minutes before serving. Thirty minutes before roast is done, remove pan from oven. Add beef broth, red wine and salt to pan drippings. Return pan to oven and continue cooking until roast has reached desired temperature. Combine all ingredients and refrigerate until ready to serve. Remove twine and rib rack if frenched or carve away rib rack by slicing along contour between rib rack and roast if not. Slice roast into individual servings (you should be able to get 2 slices per rib – i.e., a 4-rib roast should yield 8 servings). Pour Au Jus into individual dipping cups or serve in a gravy boat to be poured over servings. Pour Horseradish Cream Sauce into individual dipping cups or serve in a small bowl to be used as a condiment to the roast. The suggested temperatures for beef vary widely. I’ve always used this table from the Food Network (using FN Kitchens temperatures, not USDA) and find it to be the best. I cooked mine to 137 degrees and found it to be exactly where I wanted – a perfect medium. I just want to let you know that I really look forward to all your recipes !! I never hit a 'link' that I don't find two or three or more recipes that sound soooo good !! and are written so a person can understand AND made with stuff that is available !! so again a big Thanks and wishing you and yours a very Happy and Prosperous New Year !! Dang woman, that is beautiful. Makes my mouth water. Christmas dinner for sure. To hell with the diet. 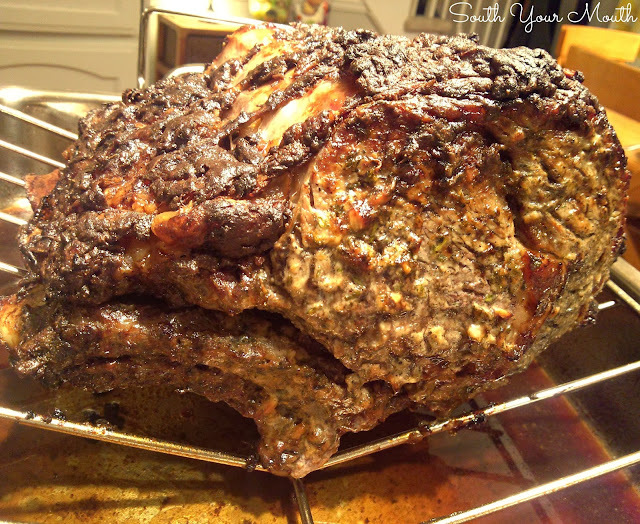 A rib roast is the only thing I have made for Christmas for the last 30 years. Yours looks like it belongs in Gourmet magazine---a work of art for sure! Love your recipes and your attitude and I am a gal from Brooklyn NY who loves Southern recipes.